5. In other comments, amateur operators expressed interest in using radio teleprinter codes other than Baudot or ASCII. Frequently cited examples were the Binary Coded Decimal (BCD), Extended Binary Coded Decimal Interchange Code (EBCDIC), Moore and Correspondence (IBM Selectric codes). 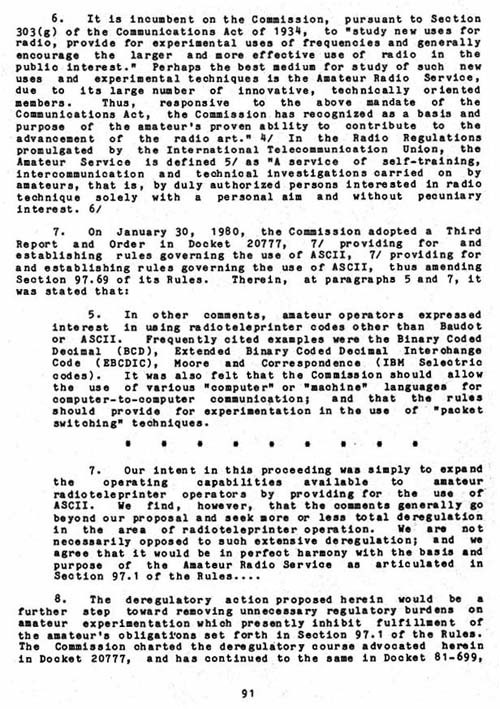 It was also felt that the Commission should allow the use of various "computer" or "machine" languages for computer- to-computer communication; and that the rules should provide for experimentation in the use of "packet switching" techniques.